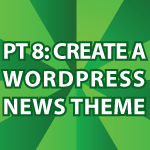 In the previous WordPress News Theme Tutorial, I finished the blog part of my theme. In this part I will finish styling: archive.php, page.php, search.php and single.php. It sounds like a lot of work, but I’m basically copying and pasting all the code from index.php. If you make sure your styling is done right during the design phase everything else just falls into place. All of the code follows the video below. For a zipped archive of the entire theme click here. If you’d like to see a plugin that I haven’t made, now is the time to ask for it in the comment section below. Hi Derek, this is a great tutorials, thank you. Just quick question: Where can I download the finished ZIP version of “wordPress news Theme” that you have created in the tutorial. Thanks. Thanks Derek for your time and I really appreciate your help. Thanks. anyway here comes my suggestions/requests if you’re still find time to churn these tutes out; i’d love to know how to create a Newsletter Submission box and another thing I’ve tried researching is creating a client login with individual access to specific client-pages. Not sure how advanced these things might be, but would sure be interested to hear how you’d tackle those topics. I’ve got other jQuery based animation questions too, but i’ll try to curb my excitement for time being 🙂 thanks again! Thanks, I checked that one out too. awesome stuff.. super helpful as always! pardon my greed but would you have a similar video around covering client-login and client-pages? I’ve looked around how to do that and it seems that people have tried to solve it with other combinations of plugins, but there seems to be various problems that occur when trying to make sure that a logged in client only gains access to one specific page, and not all password protected pages. personally i’m only looking for a solution where i provide the client accounts manually, not having clients create their own accounts..
sorry, i realise i’m asking a lot… and maybe wp isn’t even geared towards a solution like that at all. For a new theme i have just made, i use the SI CAPTCHA plugin to use for my comment but when somebody will place a comment the plugin doesn’t work. Can you tell me what the problem is and how to fix this. I have no idea. It works for me. By doesn’t work, what does it do? My wordpress post not display the HTML CODE. and not show as link. I am update the wordpress but this issue is not solved. You’re a true gem and your work is inspiring. Please shoot me a short email, I hope I can interest you in a project that I’m working on.